1) I planned doing it with a dedicated chip, that handles all the enumarations and sets current limits that I can provide. 2) Then there are wall-chargers which seems to power anything quite nicely wihout any 'smartness' - also acting as DCP. Question was - Couldn't I just short the D+ D- pins, basically act as a dedicated charging port ? Without the chip? Because as I've read, devices set their modes very differently on D+/- pins so there's no One way of defining it. Which was assured to be true. Probably any device I plug in with USB cable, might ask more than I can supply (since it's acting like a wall adapter) and could destroy my board. SOLUTION_1: So Shorting D+/- is an option (not 100% universal). This is also visible on some of the teardowned AC/DC USB wall adapters seen here. Some have resistor dividers, some seem to have other magic going on (depening on manuf. I guess). All cheap 'travel' adapters seem to have D+/- shorted. The drawback is that I have to physically limit the current if any device wants to get >1A and that can be troublesome on the design side (heating of protection components, added current consumption, possible physical faults which renders the port useless). That way I think, I get more control over the current I allow the device to take. (a bit more expensive, but much safer). Thanks for the info, I believe I've reached my verdict for using solution 2 in my case (wouldn't want to destroy any phones or my own board). I can refer you to this question for some answers, How do I design a 2A or more power supply for my consumer USB devices? Probably any device I plug in with USB cable, might ask more than I can supply (since it's like a wall adapter) and could destroy my board? On that particular subject, you are right. Assuming the device you plug in will follow the usb charging standards is not enough. I would strongly encourage you to, as good practice, implement at least overcurrent protection. With a ptc fuse for example. 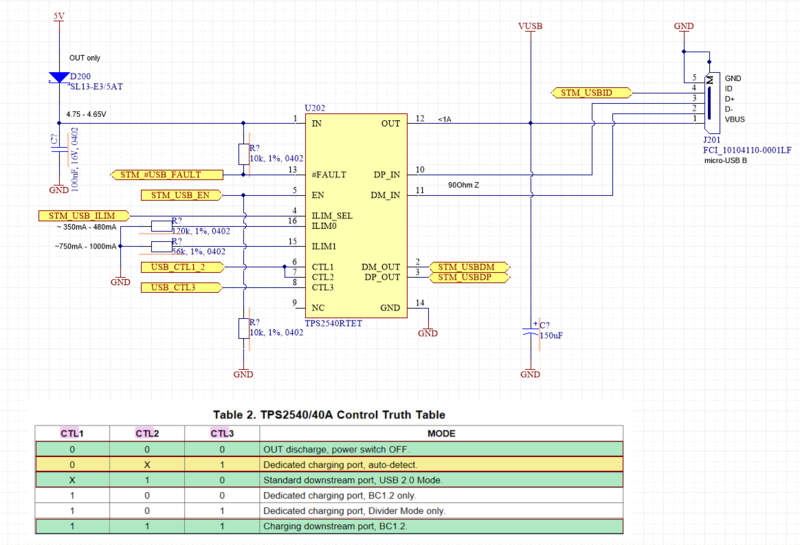 I can additionally recommend that you look into the quite compact TPS2514A IC from TI, which can take care of advertising the 1A current limit you had in mind in a way that is compliant with the usb battery charging 1.2 specification (look in the datasheet, under Figure 16. 5-W USB Charger Application). Not the answer you're looking for? Browse other questions tagged usb charging or ask your own question. What is the ideal way to handle data pins D+ and D- on a USB power adapter to be compatible with fast charging on devices? How do I design a 2A or more power supply for my consumer USB devices? How does a USB 2.0 Wall Charger negotiate current output? Is it Possible to Limit USB Port Current With a Resistor?